Entdecken Sie auf dieser Wanderung in kleiner Gruppe, was Melbourne zu einem Paradies für Kaffeetrinker macht. Die Hauptstadt von Victoria ist seit langem Heimat einer blühenden Cafékultur, von den großen Kaffeepalästen vergangener Zeiten bis zu modernen Boutique-Cafés. Treffen Sie Ihren Reiseführer im Zentrum von Melbourne, um die koffeinhaltige Szene zu erkunden. Spazieren Sie mit Ihrer kleinen Gruppe von nicht mehr als 8 Personen durch Melbournes berühmte Gassen, um die beliebtesten alten und neuen Cafés der Stadt zu erkunden. Fahren Sie mit der Straßenbahn zu den Cafés abseits der ausgetretenen Pfade, wo Sie etwas über die Geschichte des Kaffees in Australien und die wichtige Rolle der Cafés bei der Gestaltung der Melbournian-Kultur erfahren. Folgen Sie den Aromen von gerösteten Bohnen und Dampfmilch bis zur Endstation Ihrer 3-stündigen Tour. Machen Sie es sich in einem örtlichen Café gemütlich und genießen Sie ein leckeres Mittagessen und eine dampfende Tasse mit Melbournes beliebtestem Bier, das bei Ihrer Buchung inbegriffen ist. Lassen Sie sich von Ihrer Tour bis zum Rand mit Ideen überraschen, wo Sie während Ihres restlichen Aufenthalts in Melbourne Ihren täglichen Kaffee fixieren können. Out of all the tours we took throughout Australia, this was our favorite! Our guide was really knowledgable, and catered the tour to all of us. We saw and drank our way through! some amazing coffee shops, restaurants and small boutiques. The most amazing was having coffee at the ground floor of the Ambassador from Monaco's residence. Too coo! Wonderful. Cathy was very personable and we had a fun tour with her. Lovely places coffee and chocolates and of course lunch in a quirky restaurant. Much more than just a coffee tour. Yes, you'll learn about the low-key coffee shops and cafes that are down alleys with barely any signage. But you'll also learn a bit about Melbourne's history. The tour guide was enthusiastic, fun and informative. And by the way, the coffee is fantastic! This was also a very interesting tour with Sarah as a great guide once again. She took us to some iconic Melbourne coffee shops and also showed us many places to eat and have food in the real Melbourne style. I did go to quite a few of the places she recommended on my days in the city. Super tour, Sarah was so knowledgeable. History of Melbourne and its foodie growth was terrific. So many hidden treasures we can't wait to explore some more. Highly recommend this tour and the tastings were delicious. Our tour guide Sarah was fantastic. you go to places you wouldn't see on a "normal" tour of Melbourne. The weather was perfect, we couldn't ask for a better day. Lovely Guide. Very enjoyable and relaxing tour. 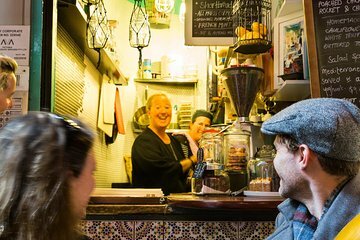 Invaluable local knowledge about the best places to enjoy Melbourne's cafe culture.